The 40V MAX String Trimmer features a patented gear drive design for amplified torque when powering through overgrowth. The bump feed head provides 15 in. of swath with DEWALT's 0.080 in. line (0.095 in. line is also compatible). The variable speed trigger offers precise power control as well as performance and runtime management with the Hi/Lo speed control switch. needed string trimmer, no oil or gas, after reading all reviews of DeWalt cordless trimmers the choice was easy. The 40 volt. I was hoping it would be the 20 volt or 60 volt as I have many tools using those batteries , but ease of use and power all pointed to the 40 volt and I am very happy with it. Having got the 40 volt trimmer it will now be easier for me to get other 40 volt DeWalt yard tools. This machine has more power than any gas weed eater I have bought in the past. cutting mostly weeds and not grass. Use safety glasses as noted. Great to have a battery powered tool that negates all the problems with gas tools. I like how it cuts the weeds quickly. The battery only lasts about 30 minutes for me, but my body wants to quit before then, so it is fine. I just work until the battery drains and then go recharge it and take a break. Could not even get the battery to charge!!!! I could not even get this product to charge.. Like the manual says the light will blink when charging 12 Hours and still blinking I will see if I still get the blinking light tomorrow if so it goes back to Lowes!! I guess there is no quality control at DEWALT anymore!! Powerful trimmer with plenty of battery life for my uses. The double string forces bumping when one string breaks before the other and that causes a little line loss each time. Use it for weeding, it has plenty of power. It works good, powerful, but HEAVY! I replaced my 4-Stroke Honda trimmer with this battery powered Dewalt trimmer. 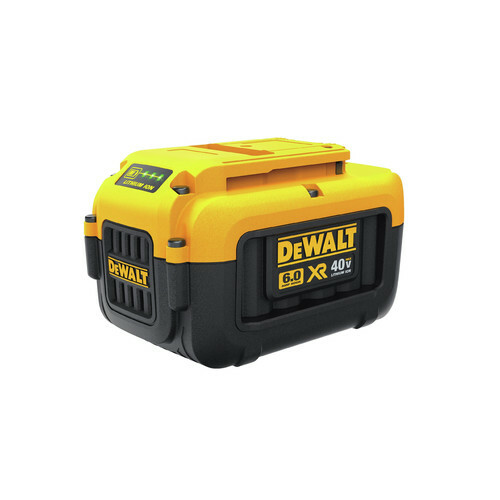 The Dewalt is lighter and has significantly less vibration. The power is as advertised - as good as a gas powered trimmer. I highly recommend this purchase. I bought the refurb units.....they run fine if working.....but after a few minutes of running they seem to start running at 50% less power. We switched other batteries and it still does same thing - so not a battery thing. Odd it happened to 2!! Just gave up. I live in Arizona, before I apply weed killer, I use the trimmer to knock down the weeds first. 40 volt battery, and I also bought a leaf blower and hedge trimmer. and they all use the same battery. I don't want to hassle with electrical cords or gas and oil mix. No more trying to start that little gas engine! I bought this trimmer to do away with the gas/oil mess. It is extremely convenient to be able to slide in the battery, pull the triggers and get after it... No mixing fuel... no pulling the start cord over and over and over hoping it will eventually start! This trimmer is every bit as powerful as any of the gas powered trimmers I have owned. It's also about as heavy and much longer too. When I leaned it up against the wall I noticed that it is about as tall as me (over 6') which actually helps to spread the weight out to make it feel more balanced. The battery lasts about 30-45 minutes of steady use switching from low speed to high as needed. I'm not a huge fan of bump feed as I tend to spend too much time re-feeding the line back through. All in all I am liking my new trimmer and have already recommended this product to several friends. CLEAR TALL GRASS ON ONE ACRE FOR FIRE ABATEMENT. I USE WEED WHACKER TO SPARE AND ALLOW WILD FLOWERS TO RESEED. I'M TOO OLD TO BE MESSING AROUND WITH PULL CORDS, OIL, GAS, AND HAVE BETTER THINGS TO DO. This is a great solution to the nightmares of two-stroke motors. It is so nice not to have to mix gas and oil, my garage actually doesn't smell like fuel anymore, and it is nice to have immediate action/power. Great product. Should have bought this quality product to begin with. Not the best design for trimming along a walkway as there is only one position for the head. Would like to see a design change that allowed for changing the cutting angle of the head, as well as being able to rotate the head 180 degrees. Also not sure about the ergonomics of the straight shaft with regards to a comfort level and reminds me a bit of the poor design CUBCADET had on their design. Would also have liked to see a second battery included in the price/package, as these types of batteries can have a short life and be very costly to replace. Has anyone thought outside the box and conducted a study for selling only the 6 Amp? how do you put new line on spool????????????????? we have tried for over a half hour. BEST ANSWER: Cpo does carry replacement spool of sting or this item. BEST ANSWER: No,Dewalt is not running a free battery promotion for the string trimmer. how long of time in one continual use do the battery last ? I noticed an extended flat plate at the base of the battery housing. is there a wall hanging accessory for this plate to hang on? If so, where do I get one? BEST ANSWER: This trimmer does not come with a wall mounting bracket nor is there a dedicated bracket.Might want to try the Gladiator wall mounting kit. What is the expected life time of the battery for normal home usage? BEST ANSWER: The battery lasts about an hour. BEST ANSWER: They make a trimmer but not an edger at this time. How long does it take to recharge the battery? Also how long do these 40V batteries last? BEST ANSWER: This kit comes with a 45 minute charger. Theoretically, the battery will last 45-55 minutes. Practically, it depends on how hard you push the unit. How long is the battery life before next recharge? BEST ANSWER: That really depends on the usage. In our estimates that battery cycle can range from 25 - 50+ minutes depending on how its used.